One of the most anticipated comedies of 2014 is the new feature from writer/director Seth MacFarlane. Following up his feature debut Ted, MacFarlane once again writes/directs and stars in a comedy, this one a western titled A Million Ways to Die in the West. 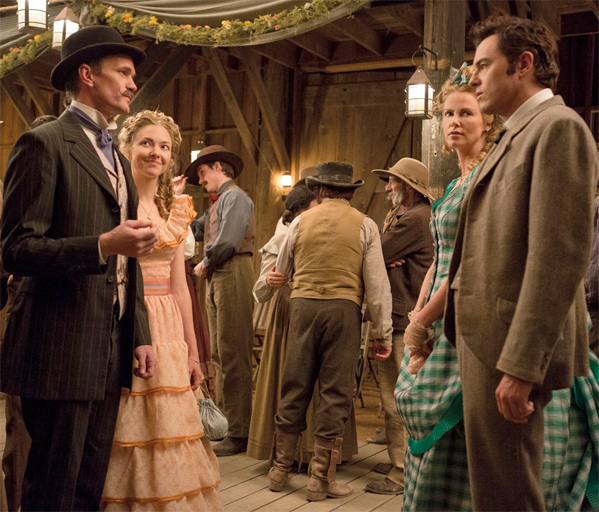 We've been waiting to see any glimpse of the movie and now have a photo showing our four main characters: Seth MacFarlane as Albert plus Charlize Theron standing next to him; with Neil Patrick Harris as Foy standing next to Amanda Seyfried, the main love interest. Liam Neeson and Giovanni Ribisi aren't pictured, and it's not a revealing shot, but it is something. Seth MacFarlane's A Million Ways to Die in the West official synopsis: After a cowardly sheep farmer (MacFarlane) backs out of a gunfight, his fickle girlfriend leaves him for another man. When a mysterious and beautiful woman (Theron) rides into town, she helps him find his courage and they begin to fall in love. When her husband, a notorious outlaw, arrives seeking revenge, the farmer must put his newfound courage to the test. The film reunites Seth MacFarlane with his Ted producers Scott Stuber and Jason Clark, as well as "Family Guy" collaborators and the film's co-writers Wellesley Wild and Alec Sulkin. Universal Pictures has A Million Ways to Die in the West scheduled to hit theaters on May 30th, 2014 this summer. I'm beginning to think that this might be a hit. Really looking forward to seeing if he can act in person in a central role. Really? I've never seen that in interviews, at most I'd describe him as self-confident, just incredibly rich.